US 13 begins in eastern Pennsylvania near Trenton, New Jersey and heads southwest along the Delaware River, passing through Philadelphia before arriving in Delaware. The route heads south through the middle of the Delmarva Penninsula to the Chesapeake Bay which it crosses via a bridge and tunnel to Virginia Beach. From the Tidewater area of Viginia, US 13 continues south to North Carolina where it continues heading south and west to end at I 95 in the Fayetteville area. I drove US 13 from end to end in 1995, but took photographs of the route on multiple trips between 1995 and 1998. View individual pictures of US 13 on Flickr. Learn about how the alignment of US 13 has changed since it was originally commissioned. 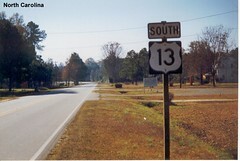 Information about the ends of US 13 can be found here on the www.usends.com website. Additional photos of US 13 in Pennsylvania can be found on the Pennsylvania Highways website. Additional photos of the northern end of US 13 can be found on the Central PA/MD Roads website.